We saw the THG movie Friday night, loved it, and we were happy that our hairstyles were fairly true to form! 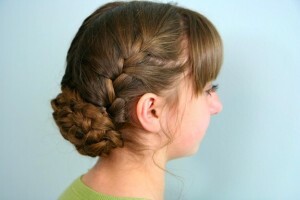 We were also excited to receive an email from Linda Flowers, the Lead Stylist on set for The Hunger Games movie who had seen our hairstyles on YouTube and wanted to let us know that she liked them and that she wants to Skype me for a personal tutorial with her! I am so0000 EXCITED!!! 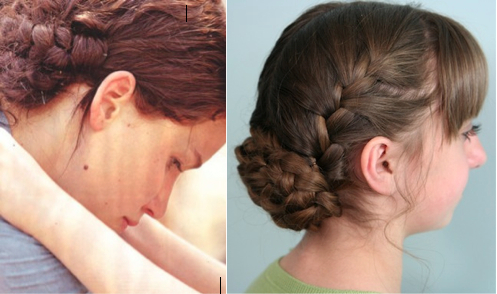 For this hairstyle worn by Katniss during “The Reaping” scene in the movie, you basically follow the same steps as we showed in the Prim Braids for the two French-backs into normal braids. 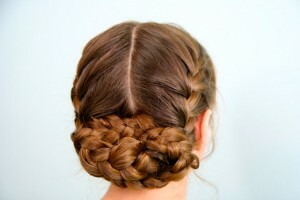 The only difference is that you “fold in” and pin the lower braids into a flat, low bun. The result is super cute, and sure to get you compliments!